WT 3/c Robert L. Hodges, son of Mr. and Mrs. Fred Hodges, attended Frederick High School; husband of the former Vinita Jo Flowers. 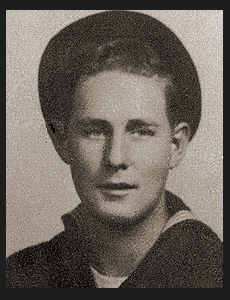 Entered Navy in Jan., 1942, trained in Algiers, New Orleans, Louisiana, Long Island City, N. Y. and San Diego, Cal. ; served in France, Panama, the Philippines, Guam, Hawaii, New Caledonia, New Zealand, Guadalcanal, the Aleutians, Alaska, Canada, the Admiralities. Awarded Am Theatre Ribbon, Asiatic Pacific Ribbon, ETO Ribbon.